25-oz Earth’s Best Organic Baby Formula for $17.35 Each, Free Shipping! There's an Amazon promo code that will get you cheap organic baby formula if you get in while the price stays low! 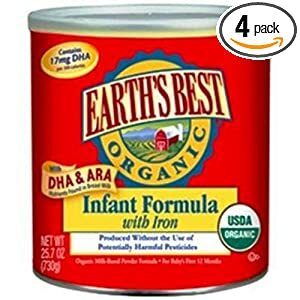 Right now, Earth's Best Organic Infant Formula with Iron, DHA & ARA is available in a four-pack of 25.75-ounce cans for $84.15 when you order it with Subscribe & Save. Use Amazon promo code EBFORM33 to bring that price down to $69.30. Final price for each can is just $17.35! Remember, you're under NO obligation when you order with Amazon's Subscribe & Save option. Just go into your account and cancel the option as soon as your order ships if you don't want to automatically receive shipments in the future.